TRACC is learning how to improve our conservation efforts. Every year we have undergraduates come to us in order to conduct undergraduate projects. At TRACC, we have marine biologists, divemasters and volunteers all keen to help with scientific investigation, making it a great place to conduct a project. 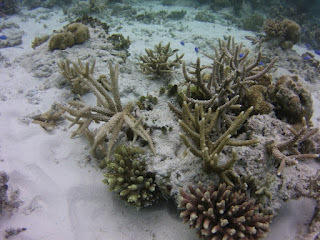 Planting coral on a damaged reef crest. 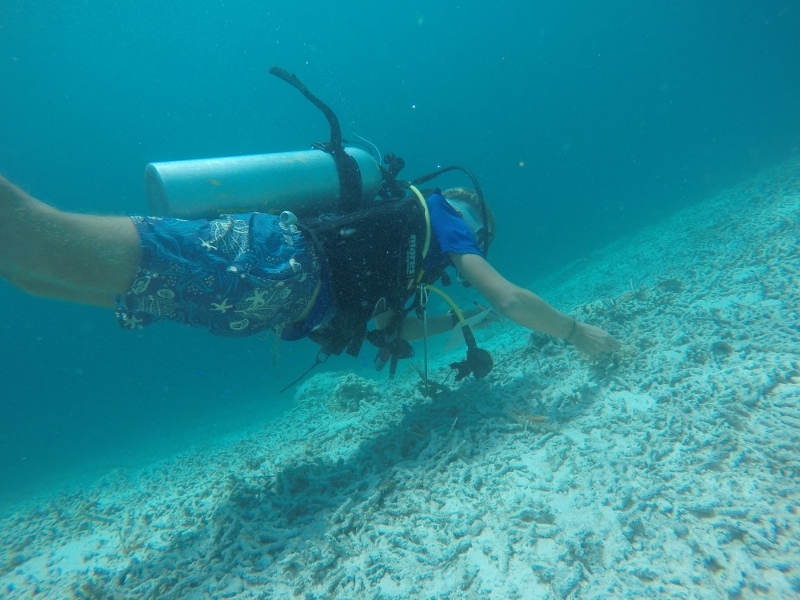 We recently hosted two students from the University of Swansea; Dan Stevens and Jack Gourlay who worked on reef crest restoration and artificial reef fish assemblage respectively. This blog post is a brief summary of Dan's project. One of the main conservation activities at TRACC is replanting hard corals to restore 3D structure and biodiversity to severely degraded reefs. Reef crest restoration is something we aspire to become extremely efficient at as without a healthy reef crest entire islands can change shape and even slowly erode away. Dan chose to conduct a project to determine which restoration methodology is best at reintroducing hard coral to reef crests. Two sites were selected upon the TRACC crest reef approximately 100 meters apart. Two areas of 2 x 10 meters were marked out upon the reef crest and then sub divided into three 2 x 2 meter experimental quadrats with two 1 x 2 meter control patches between. In each of the larger squares one treatment was added as shown below. The red crosses represent controls i.e areas of the reef crest with no treatment given. Dive Reef crest surveys – The entire reef crest area where the experiment was conducted was split into 5 different 50 meter sections. The survey would involve 2 divers drifting and tallying all the fish in each section. The aim of this survey was to see whether there is a movement of fish from the already restored area to the newly restored sites. These surveys were conducted twice daily. Snorkel reef crest surveys – Snorkelers would swim from one end of the reef flat to the other – a length of 250m. This was split into two separate zones. In each zone all individuals in the following groups were counted; Butterfly fish, Triggerfish and Sea Urchins plus any other interesting fish/turtles. These fish families were chosen as they are reef health indicator species. reef crest corals after 2 years of growth. Point count surveys – 2 divers swim over the sites counting all the fish which within the quadrats. Divers would then hover 3 meters away from the sites, tallying the fish which move into the sites. Preliminary results show concrete wedging to be the most effective treatment for reef restoration.